What is a FATF’s Grey List? What does it mean to be on the Grey List? Why did Pakistan get into the List? FATF (Financial Action Task Force) also known by its French name, Groupe d'action financière (GAFI) is a global task force which was formed in 1989 on the initiative of the G7 to combat money laundering, terrorist financing and other illegal activities related to the international financial system. The task forces monitor financial transactions of countries worldwide, reviewing if they have taken the required steps against curtailing the flow of funds to blacklisted organizations i.e. mafias, terrorist outfits, banned groups or organizations who face economic sanctions from UN-member countries. FATF releases a list of countries, usually annually, after its review and sorts them according to their performance against activities they have deemed illegal. FATF’s grey list includes countries that are not doing enough to fight money laundering and terrorist financing calling them "Non-Cooperative Countries or Territories" (NCCTs). 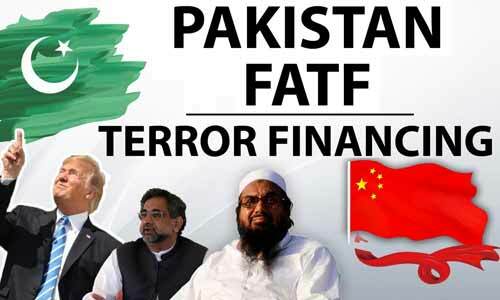 FATF had already issued the warning in February and formally announced that Pakistan has been placed on FATF’s so-called grey list. This effectively means that we are now only one step removed from being explicitly labeled as a sponsor of terrorism. See Also: Which Countries are FATF's Members and which countries are in Black List for 2018? Like many Pakistanis, I am galled by the duplicity of the ‘international community’. Shifting all the blame for the global and varied phenomenon that is ‘terrorism’ to a handful of countries is at best counterproductive, and at worst outrageous. There is hardly a state in the world today that does not use ‘terror’ as a political weapon, whether to suppress dissent at home or serve cynical strategic interests abroad. It is believed that Pakistan was included in the list because Jamaat-ud-Dawa and Falah-i-Insaniyat Foundation, both of which are designated as terrorist organizations by United Nations, are allowed to work freely in the country. Pakistan’s inclusion has raised a lot of concerns in the country and has hinted at a propaganda against Pakistan. The reason behind this is that FATF evaluates country’s financial system to determine if they are to be included on the blacklist. However, this time, no such evaluation was done and FATF just acted on United States of America’s proposal with the backing of France, Germany, and Britain, as per some reports. The specifically ‘Islamist’ brand of terror that has enveloped Syria, Libya, Iraq, Afghanistan, Yemen and spectacularly rears its head in Western countries regularly cannot be attributed only to terror financing in Pakistan or the few other countries on the FATF grey (and black) list. Whether one considers the historic support of Western imperialist countries to the factories of Islamist militancy that were built during the 1980s or the militarism and xenophobia that has characterized the dubious ‘war on terror’, the material and ideological terrain upon which ‘terrorism’ thrives are sustained by states the world over. Having said this, those of us who for years have been crying hoarse over the establishment’s alleged policy of patronizing religious militancy also know it is not Washington, Delhi or London that is responsible for our ever-intensifying isolation on the global stage. It must be debated whether we can claim that Pakistan is purely a victim of terrorism that is imposed upon us from the outside, or that our self-defeating policies can be justified by the need to protect the state from the designs of ‘enemy’ countries. No matter how much we feel hard done by the hypocrisy of others, adopting a self-righteous position based on the premise that Pakistani state policy is not the primary cause of the crisis is getting us nowhere fast. My sense is that the front-runners for elected office will not say much of substance; they will continue to heap blame on one another for our problems, terrorism included. No one will bring up fundamental questions about the failures of ‘national security’ policy. Or talk about making peace with our immediate neighbors and thereby granting our people a massive peace dividend. One reason is that many of our mainstream parties know they have to do a deal with religio-political groups to come to power, including those militants who are now being mainstreamed. Note that the Ahle Sunnat Wal Jamaat chief has been cleared to run for elections, not to mention Khadim Rizvi’s Tehreek-i-Labbaik Pakistan and the Tehreek-i-Allah-o-Akbar (read: Milli Muslim League aka Jamaatud Dawa). In short, political expediency plays out before our very eyes even while officialdom continues to spew rhetoric about eliminating all vestiges of terrorism. Inclusion in this list is not good for any country especially a country like Pakistan whose global reputation continues to suffer. Firstly, Pakistan’s inclusion in the terror financing list portrays a negative image in the world. It also conveys the impression that a country’s financial system is weak and effective measures aren’t being taken to halt money laundering or financing groups that have been banned for indulging in terrorist activities. Countries placed on these lists see a decrease in foreign investment and foreign companies hesitate to invest considering the potential ties to terrorist activities. It is bad for the reputation of other companies as well. No company wants to be doing business with a country that has possible ties with terrorist funding activities or lacks a process that prevents such activities. Apart from this, it will be difficult for Pakistan to get foreign loans from IMF, World Bank or Asian Development Bank etc as well. It could also prove hard to raise debts from international markets. Foreign banks (like Standard Chartered) may also decide to pull out, hitting the financial sector of Pakistan. Being put on FATF’s grey list shows that the viability of the state as well as the future of an extremely youthful society, whose ordinary men, women, and children have their whole lives ahead of them, is at stake. If Pakistan fails to satisfy FATF with their devised strategy, then Pakistan will be placed on the blacklist. In case Pakistan is placed on the blacklist in June, it could have an almost irreversible impact on the economy. Blacklisted countries are those that are unwilling to fight money laundering and terrorist financing. Recently, Pakistan’s image has improved overall and several big companies have announced their intentions to invest in the country (the auto and telecom sectors being a prime example of this). In case Pakistan is blacklisted, we might see these companies step back and not invest here at all. International isolation and its political and economic fallouts should concern us, but our crisis is primarily a domestic one. We must get our own house in order by questioning and then overturning the logic of state policy in Pakistan to create a viable state and a peaceful society. Until and unless the opaque policies of decades are brought to account, our society will continue to be held hostage to terror. We need courageous and visionary leadership that can address the deep societal crises that decades of self-destructive policies have generated. As election campaigning picks up steam, discussion about ‘terrorism’ has receded into the background. Why the eerie silence about a subject that has been a permanent feature of the public sphere for years? Surely those who are serious about winning governmental power to serve ordinary Pakistanis must have something to say about ‘terrorism’ and future policies to address it. Hate speech on the (mainstream and social) media and the doctored educational curricula must be addressed, especially given the huge number of frustrated young people that continue to be drawn towards right-wing militant ideologies. A uniform system of education irrespective of class background is imperative. Young Pakistanis need messages of peace and tolerance, and policies that guarantee health, housing, and employment. If Pakistan develops a report that shows how it is going to fight against these activities then hopefully it will be removed from the grey list. A state that values its people, its needs and promotes critical thought can move beyond grey and blacklists. The question, as ever, is who is brave enough to own such a political programme? Can we quote this content in Pak Affairs paper or in Essay paper as it is mention here ??? Basically it is for essay yet it makes a great content not only for Pak Affairs paper but also for IR.